This site is intended to bring together a rather haphazard collection of documents to do with the history of the subject called ‘English’ in our education system. If you can suggest or offer other documents, please contact me. Another page brings together various systems that have been used for ‘diagramming’ sentence structure in different countries. Keith Davidson. 2006 (formerly examination officer for the University of London exam board): ” … the subject English” (English, English Studies, English Language, English Literature, Functional English… Keith Davidson reflects on what English is. ) From English, Drama, Media 6, 2006). George Keith, ‘Language study at Key Stage 3’ (In Ronald Carter, 1990. Knowledge About Language and the Curriculum (The LINC Reader). Hodder and Stoughton. Contains lots of examples from old exam papers. Laurence Walker. 2011. “200 Years of Grammar. A history of grammar teaching in Canada, New Zealand and Australia, 1800-2000” (Bloomington, IN: iUniverse). 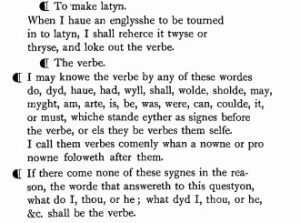 languages, each with its own printed grammar, and some with supplementary readers as well. The second area into which Sonnenschein channelled his energies was the Joint Committee on Grammatical Terminology (JCGT), – the political arm, it might be said, of the practical work being done through the PGS. The committee published its recommendations in 1911 (Anon 1911). There was little danger of them being overlooked: with seemingly tireless energy Sonnenschein forged links not only with eight different associations in Britain, who were persuaded to nominate members for the Committee, but also with like-minded colleagues in the United States, Germany, Austria and France. However, for all this activity Sonnenschein’s campaign came to little. This was in part because of the opposition of no less a figure than Otto Jespersen, who took a different view on both theory and terminology (Walmsley 1989). Derek Gillard’s Education in England: a brief history gives an excellent overview of how our education system evolved since the Romans, including interesting explanations of the changing role of ‘grammar’ and ‘grammar schools’. I have extracted particularly relevant paragraphs here. A scanned online copy of Grammar-land (1878, by M.L.Nesbitt), an entertaining story for children about how Mr Noun, Dr Verb and others divide the words of English among themselves in a courtroom, with some intelligent and very undogmatic arguments, and nothing about ‘errors’. ‘phrases’ used much as in modern phrase-structure grammar, including noun-phrases and adjective-phrases (but no PPs or VPs). the classification of whole sentences as simple, complex or ‘double/multiple’ (corresponding to the more recent ‘compound’). a system of sentence-analysis using columns (as in Nesfield 1891 ) for subject, verb, indirect object, etc. the five cases of English nouns: nominative, vocative, accusative, genitive, dative (but no ablative!). A classic English grammar for schools: Nesfield’s “Manual of English Grammar and Composition” (1916 edition). Ordinary Level (‘O-level’) – papers supplied by Keith Davidson except where otherwise stated.